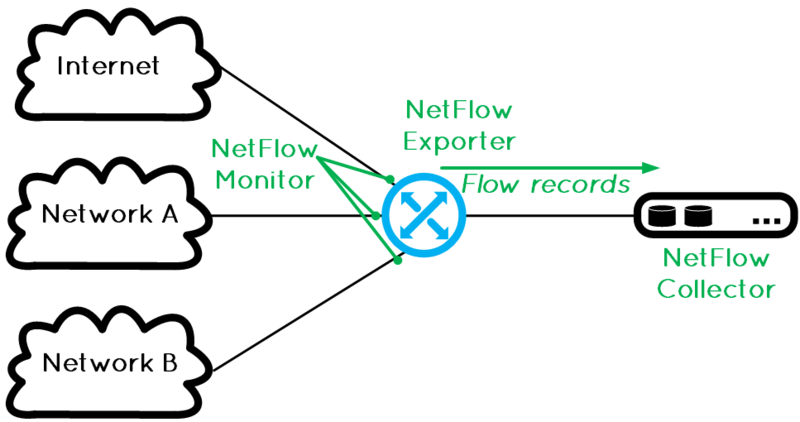 On Cisco routers, by default the BGP protocol will not do load-sharing – and even less unequal cost load-sharing – across multiple links, for traffic to the same eBGP destination with different AS-path. Let’s see how we can change this. We can configure the command: “maximum-paths n”, but it only works if the weight, local-pref. 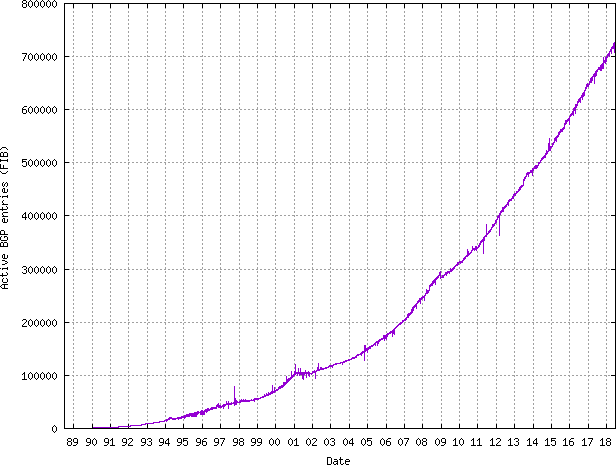 and AS-path attributes are the same across the different uplinks. So how can we do load sharing if we are multihomed to different ASes? In that case, we must use the BGP command: “bgp bestpath as-path multipath-relax”. AS-4 is our multihomed company. 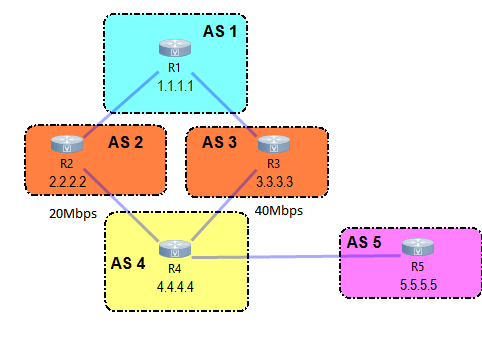 They have two BGP upstreams: AS-2 and AS-3. AS-1 in blue represent the Internet. 1.1.1.1 here is “the Internet”. AS-5 is a remote site or a branch-office, they are using a different AS number for some reason. AS-4 is providing Internet access to them. 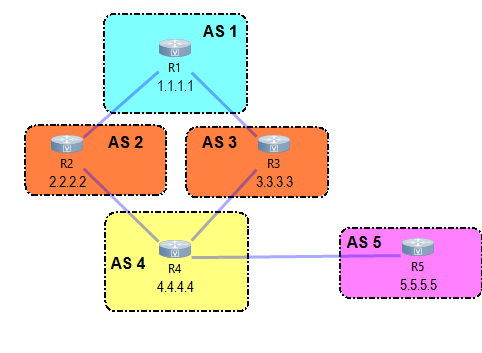 Note: in this topology, AS-2 and AS-3 are sending the “full” BGP table to AS-4 – even the full table here is only 4 prefixes – and also the default-route. This is to demonstrate that this command works with the default route and with a specific prefix. First, let’s see this topology without the command bgp bestpath as-path multipath-relax. Very straightforward, each router announces its own loopback interface. 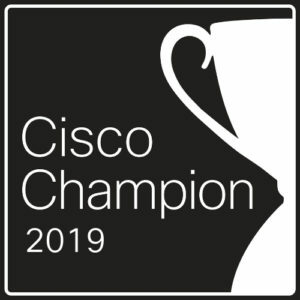 In that situation, AS-4 or R4, receive the default-route and the prefix 1.1.1.1/32 from AS-2 and AS-3, and choose one of then based on the Cisco BGP best-path selection algorithm. In that case, the second path is the best because of the rule #11 of the selection algorithm: Prefer the route that comes from the BGP router with the lowest router ID. Note: I started all the routers at the same time and the command “bgp bestpath compare-routerid” is enabled by default. Why? Because now we must refer again to the BGP best-path selection algorithm, point #10: When both paths are external, prefer the path that was received first (the oldest one). The oldest one! This is made to minimize route-flapping. We keep the oldest received path. In that situation, if AS-3 make a maintenance, the default-route for AS-4 will change again. Please note, the “maximum-paths n” command is mandatory, the value should be at least 2 in this case, otherwise BGP will choose only one path. You can see for the default and 1.1.1.1/32 prefixes we have multipath. Then, you can also see that AS-1 is doing transit between AS-2 and AS-3 in both directions (prefixes 2.2.2.2/32 and 3.3.3.3/32) and in that cast the shortest as-path is still the best path, without multipath. You cannot have the same result with the command ” bgp bestpath as-path ignore” because this command skip the as-path length comparison yes, but you still receive the prefix from two different AS and this is not multipath. In conclusion, bgp multipath works only for the default-route received by your upstream and with prefixes with the exact same as-path length. Now we have 20Mbps between AS-4 and AS-2 and 40Mbps between AS-4 and AS3. Now you can see we have a share count 2:1 between the two interfaces, based on the bandwidth configured.